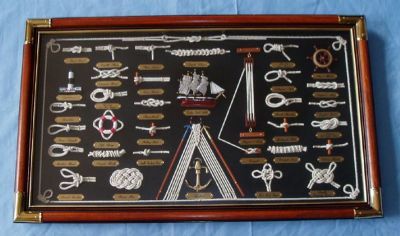 Sailing requires knowing how to tie a variety of knots, and chosing one most appropriate for specific situations. Joining a line to another line, tying a line to a ring, tying up to a piling or post and to a cleat. Click knot to view animated construction. Good sailors take pride in their ability to chose and tie knots. For practice, a section of rope six feet long with a diameter of 1/2" is a good size. Tie each knot several times to make a mental picture of the sequence. With practice you'll be able to tie a knot without thinking about it. The end of the line that you work with in tying knots is called the "Bitter End." The main length of line is the "Standing Part."